Select the size that best matches your pet. 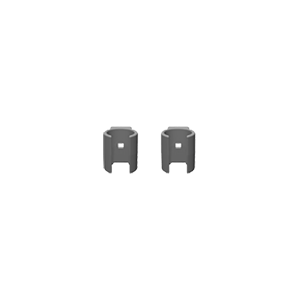 Choose your color below to finish. 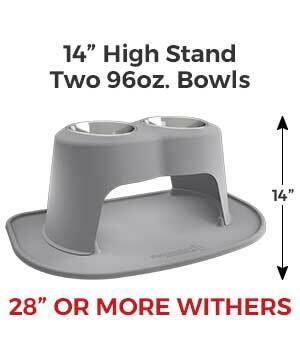 Based on your measurements we recommend the 1.5" High Stand with two 8 oz. Bowls. 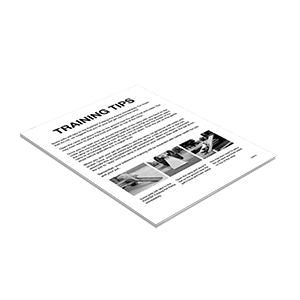 As your pet's owner you have the final say if you believe a different size is best for your pet. 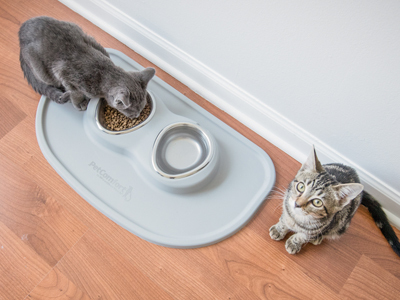 The High Feeding System features a non-toxic stainless steel bowl, and our unique mat and stand that catches and contains pet-related mealtime messes. 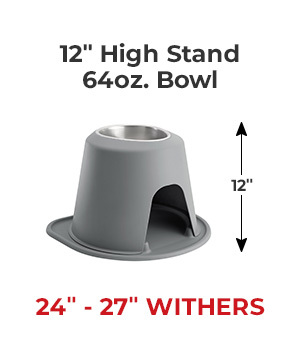 This system elevates your pet's food and water to a more comfortable level helping correct behavioral issues, and may even help in alleviating certain hip and joint issues. 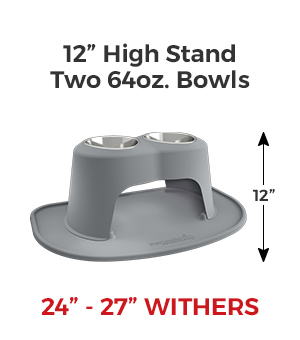 Featuring the only NSF Certified, stainless steel pet bowls on the market, these ergonomically designed, patent-pending bowls allow easy access to food and water for your pet, and were designed specifically with their comfort in mind. Now available in a single or double bowl configuration! 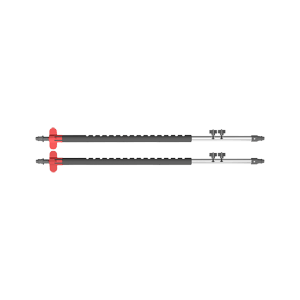 Receive FREE SHIPPING on any additional feeding systems when you order them together! 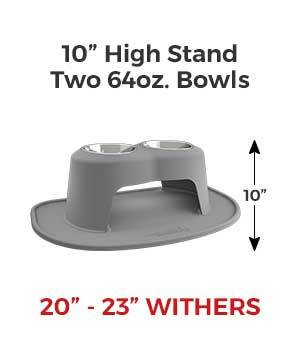 Receive FREE SHIPPING on an Extra Pair of Bowls (for when your main set is in the dishwasher) if ordered along with a feeding system! 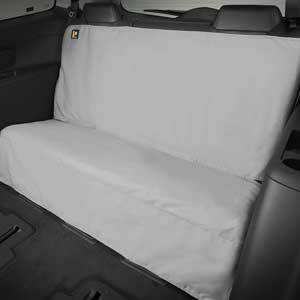 CLICK HERE for detailed information about our Free Shipping offers. 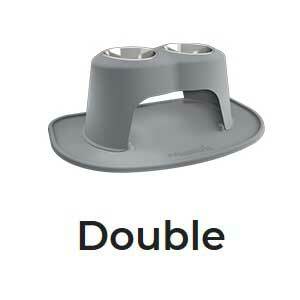 We bought the Double High Feeding System for our pup, Hannah, and are incredibly happy with the purchase. 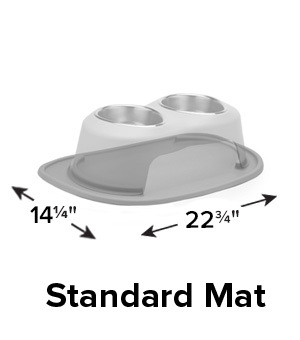 You can tell immediately the stand an mat are both super high-quality and heavy duty! The two bowls that come with the system are fantastic too, and are a pretty unique shape. Overall, can't recommend this product enough!!! Just bought your bowl, for my Boxer, Mr Jesse, good for his over all heath, he's 5 Yrs old, thank you for posting his picture on your website, God bless you all. My foster kittens decided to go swimming in their feeding system this weekend, and I am so thankful for the XL mat. The larger coverage held almost all of the water and kept it completely off the floor. Our GSP, Prince, liked it immediately! 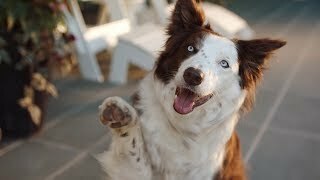 We have a 15 year old Border Collie who had lost interest in eating because she struggles to bend down to reach the bowl we had on the floor and she also had trouble getting the food out of the corners of that bowl. We've only had the The Pet Comfort Feeding System for 1 week but already we are seeing a difference. The fact that she doesn't have to lean down is wonderful as her back hips couldn't support her and her feet were constantly slipping out from under her as she tried to eat. Also the shape of the bowl works great because she doesn't have to chase her food around the bowl anymore which had previously lead her to giving up and walking away without eating. Finally the mat is great and catches all the spills our old girl makes as she eats and drinks. It's wonderful to see her enjoying her food again and she eagerly awaits meal times because she can eat and drink in comfort. We have very picky standard poodles and have found that not only are the bowls and stands great for feeding but we also feel it enhances the aroma of the food and entices our dogs to eat. 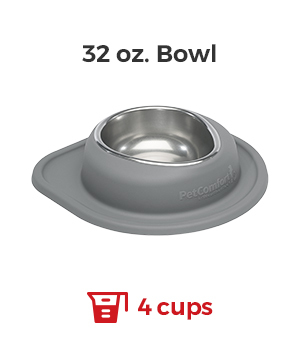 The true stainless steel also makes it less noisy when the pups eat from them and they don't have the tin or hollow sound from all other bowls we have tried. Our dogs love them and we love them. 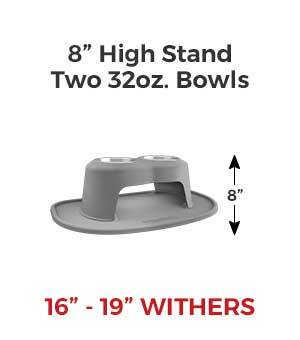 The high quality bowl and stands are easy to clean and no mess and no fuss. Honestly, best thing for pets ( and humans). Great Product!! Can I use other bowls or do I have to use PetComfort bowls? 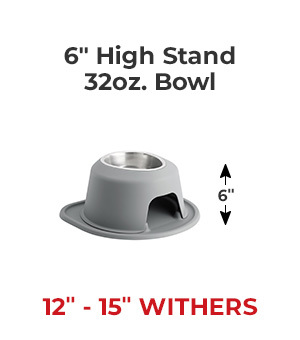 The bowls included with your PetComfort Feeding System are customized to fit perfectly with that system's size and shape, no other bowls will fit. 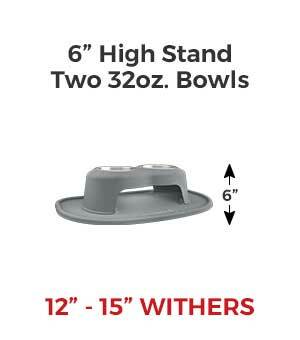 You are able to purchase additional PetComfort Bowls for your system by clicking here. 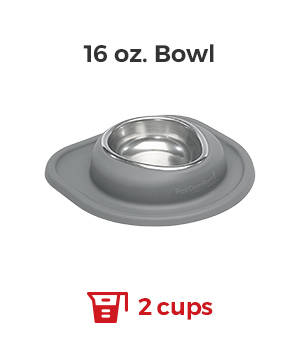 Does my feeding system include bowls? Yes. 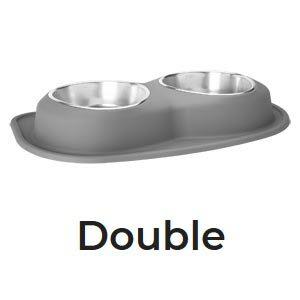 Each PetComfort High Feeding System includes one 304 Stainless Steel bowl if you order the single configuration or two bowls if you order the double configuration. 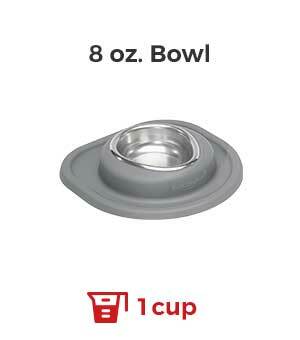 Can I order replacement bowls? Certainly! 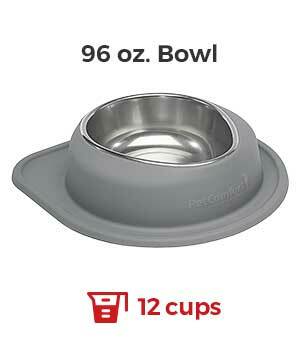 Additional feeding bowls can be purchased on the PetComfort Website or by clicking here. 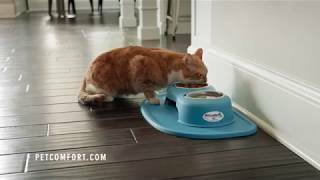 Can I travel with the PetComfort Feeding System? 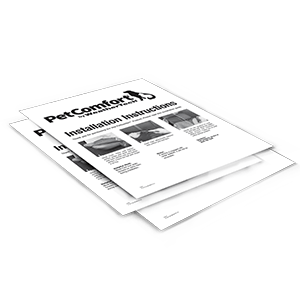 While the PetComfort Feeding System is sized for your pet(s), it can be quickly disassembled and each of the three components (stand, mat and feeding bowls) can be packed and transported. My pet is a messy eater/drinker. Will the mat contain his/her mess? Definitely! 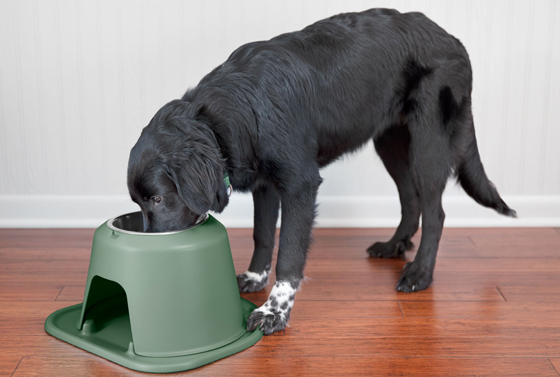 The PetComfort Feeding System was designed for even the messiest of pets. 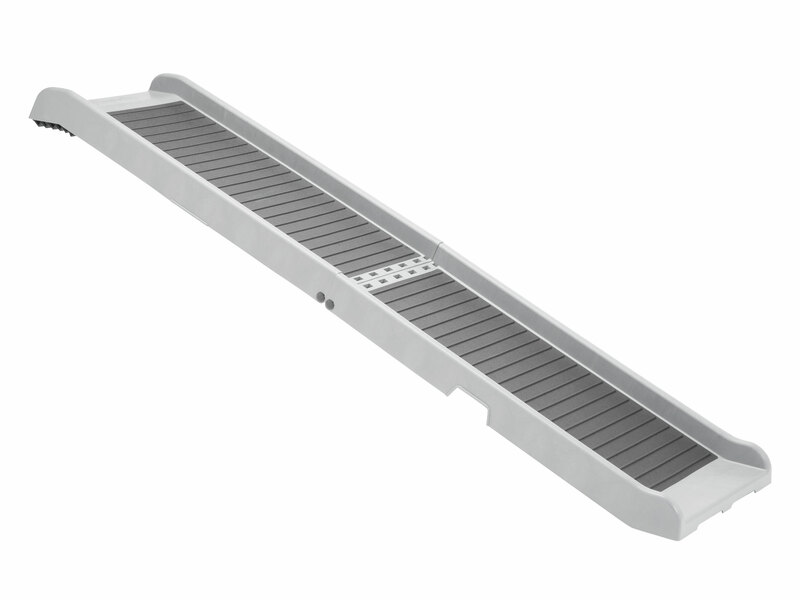 Each system comes complete with a mat positioned below the stand/feeding bowls which is specifically engineered to contain most food and liquid runoff. 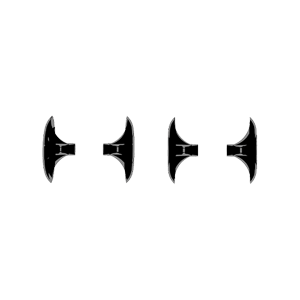 Can a cat use the feeding system? Absolutely! We developed feeding systems in smaller sizes that accommodate both smaller dogs and cats. How deep are the PetComfort Stainless Steel Bowls? 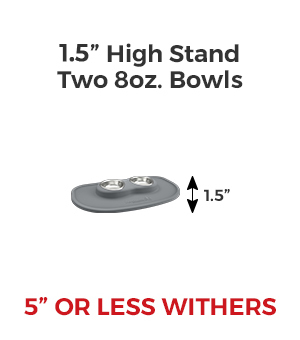 The 8 oz bowl is 1.50 inches deep. The 16 oz bowl is 1.875 inches deep. The 32 oz bowl is 2.56 inches deep. 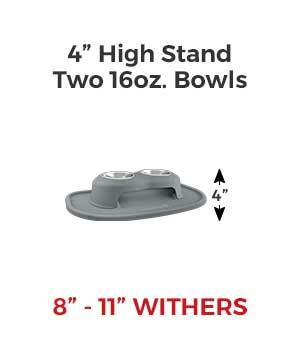 The 64 oz bowl is 3.00 inches deep. The 96 oz bowl is 3.50 inches deep. 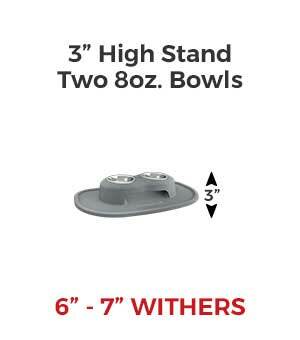 Are the bowls made in the U.S.A? 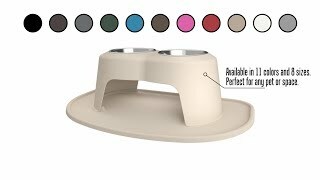 Every component of the PetComfort Feeding System is designed, engineered and manufactured in the USA. NSF International is an independent, accredited organization that develops public health standards and certifications that help protect food, water, consumer products and the environment. 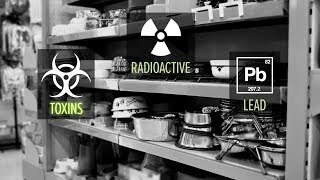 They test, audit and certify products to protect and improve global human health. 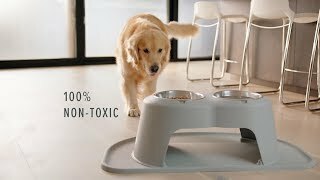 Is the PetComfort Feeding System dishwasher safe? Yes! 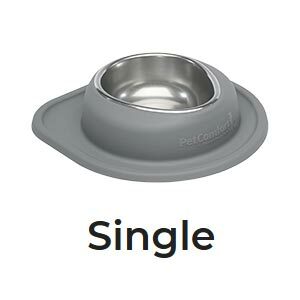 Every part - bowls, stand and mat - of the PetComfort Feeding System can be safely cleaned in the dishwasher. How stable is the feeding system? Is it weighted so my pet can't move it around? The innovative stand is made of a rigid polymer, which can withstand even the most aggressive eaters. 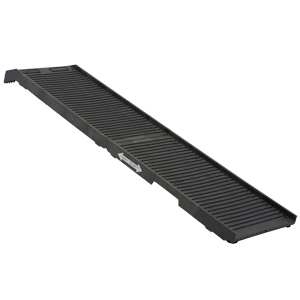 The softer mat material helps keep the stand from sliding, and contains positioning ribs that keep the stand locked into place. What is the feeding system and bowls made out of? 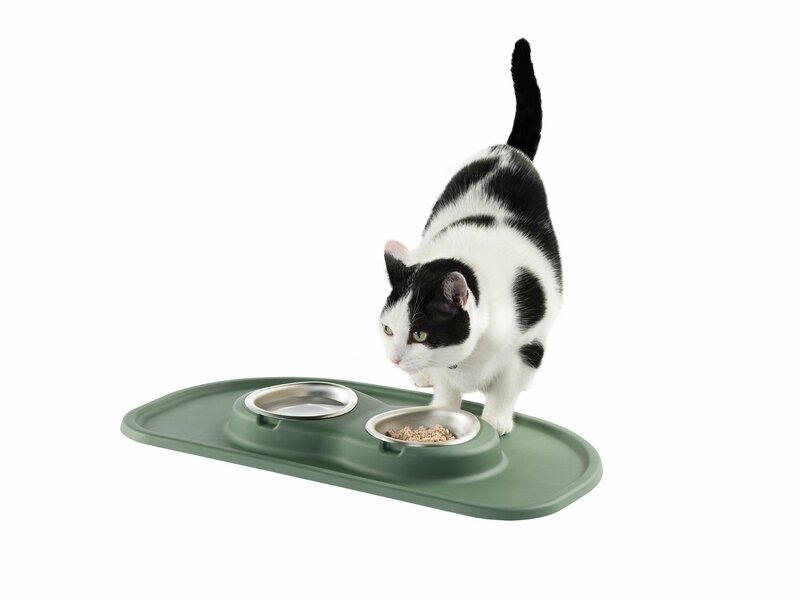 The feeding system (stand and mat) uses FDA approved, human food grade polymer plastic. 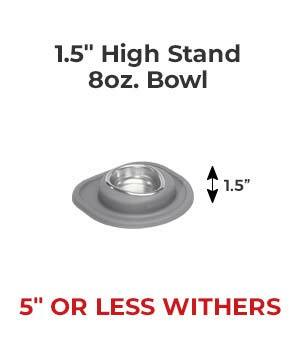 The bowls are made from heavy gauge US stainless steel and are NSF certified, making them safe for even human food! Is the feeding system BPA free? 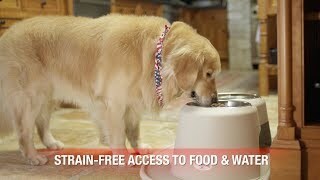 The PetComfort Feeding System is not just BPA free. It is also free of phthalate, lead, radium, mercury and other toxins! Does the feeding system have PVC? 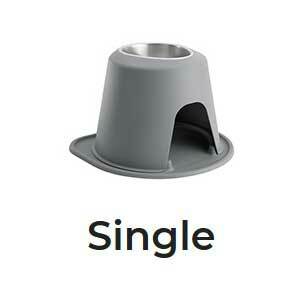 No, the PetComfort Feeding System only uses FDA approved human food grade plastic and polymers. 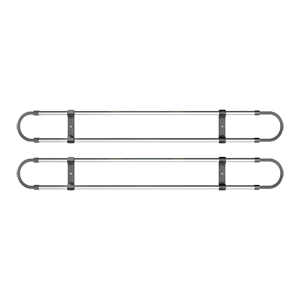 Will the feeding system prevent mold and mildew? Yes, our stand and mat use an anti-microbial/fungal additive for a healthier, germ resistant feeding environment, however we recommend regular cleaning of your complete PetComfort system with a mild dishwashing soap! What type of antimicrobials and antifungals are used in these parts? 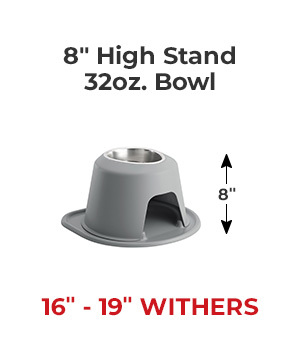 The PetComfort Feeding System uses a silver-based antimicrobial additive and a zinc-based antifungal additive in the plastic for the stand and mat. Both of these additives are non-toxic, FDA compliant, and safe for human food contact. 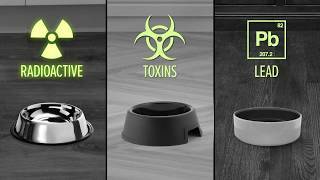 Are stainless steel or ceramic bowls the cleanest and safest options for pets? Quite simply stainless steel is superior. The less porous a substance is, the less microorganisms can grow on said substance. Using a product that you can place in the dishwasher has the added advantages of using heat and steam to kill the germs. 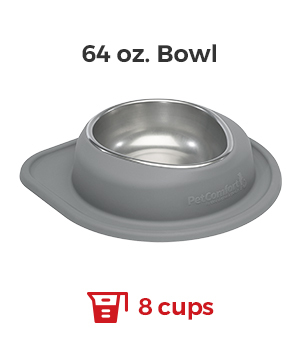 Why are raised bowls better than feeding my pet from the floor? 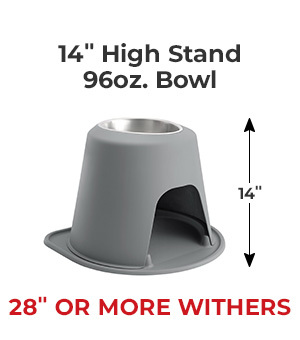 Raised bowls have been shown to help minimize movement and extension with animals that have a myriad of issues, ranging from orthopedic, neurological to a variety of other conditions. Please consult with your veterinarian if you have additional questions. 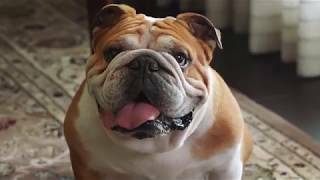 My pet gets the hiccups after eating; will the feeding system help prevent this? How fast an animal eats can affect how often they get hiccups, by simply slowing them down you may minimize the chances of this happening. My pet has arthritis, neck or back problems. Will this feeding system help? This system will help patients with arthritis, neck and back problems by reducing overall movement for the pet, making mealtime more comfortable. My pet has gas and burping issues now. Will the feeding system help? With an elevation of the food, as well as a shallow bowl, there will hopefully be less air swallowed thereby minimizing gas and burping.